Getting back into showcasing some of the different percussion instruments that I play, I definitely feel that the HAPI Drums deserve some recognition. They have brought some of my pieces to life with their unique melodic and percussive qualities, and captured audiences’ eyes and ears for a few years now, hopefully not just because they look like waffle-makers (although that would a be great selling point – “Free Waffles with Purchase of CDs!” – I’ll consider it). As for their percussive and melodic capabilities, they are precision-tuned steel tongue drums in a set key, played with fingers or mallets (I prefer fingers), with a sound somewhere between a Hang Drum/HandPan and a vibraphone. The different pitches come from the different sized cut outs on the top of the instrument, and the percussive tones can be achieved by hitting in between those notes or in the center of the drum on the logo. 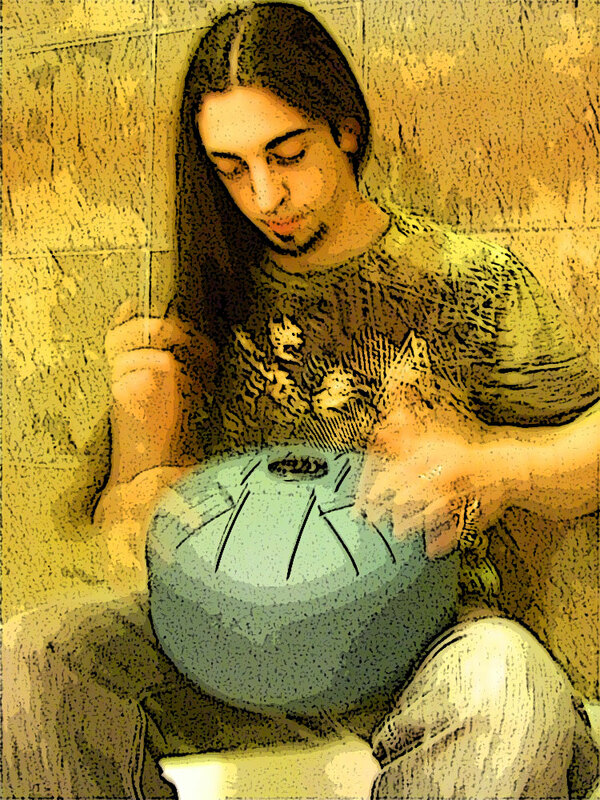 The HAPI Drum is another example of an “idiophone” – you hit it, it resonates, and thats where the sound comes from – very simple design (in the same family as my Udu Drums). The notes are strategically positioned around the top of the instrument so that when you hit one note, the other notes around it ring sympathetically to create its unique timbre, which I can only describe as “colorful” and packed with overtones, yet when you hit one note and mute all the others, it has a very dry/dull sound – go figure, you sneaky ears! As I mentioned before, each HAPI drum is in a set key. There are plenty of options available as to which key, but choose carefully to pick the one that appeals most to you. I first went with the E minor pentatonic tuning because of how well it would go with my Kalimbas (in A minor), and then I added the D minor pentatonic to have a full octave and a half of the D Dorian scale between both of them. This continuous series of notes in a scale (each drum has 8 notes total, these two have 4 overlapping notes) allows for some nice melodic applications in a few pieces, while sometimes I’ll take a more rhythmic approach – I’ve even used them for bass lines occasionally. As far as the playing technique goes, there really is no right or wrong way to play a HAPI Drum! I often use something similar to tabla techniques with them for more precision and speed. Because the instrument has such a long sustain, muting techniques are a nice contrasting touch to use also. For more recent recordings, I’ve been treating them like guitar tracks, and “doubling” the tracks – playing it twice, each on mono tracks panned hard right & left to fill up the stereo image a bit more. To record these wonderful instruments, I’ve had the best luck with a large-diaphragm condenser mic positioned about 12 inches/30cm directly over the center of the drum, in a cardioid pickup pattern. For recording two HAPI Drums at the same time, place the mic at the same height, centered between the two drums (or just use two mics). Any other positioning will affect how present certain notes will be (closer notes to the mic will be louder, and those further away won’t be heard as well). My ONLY critique about this instrument is its name, which isn’t really a major concern. 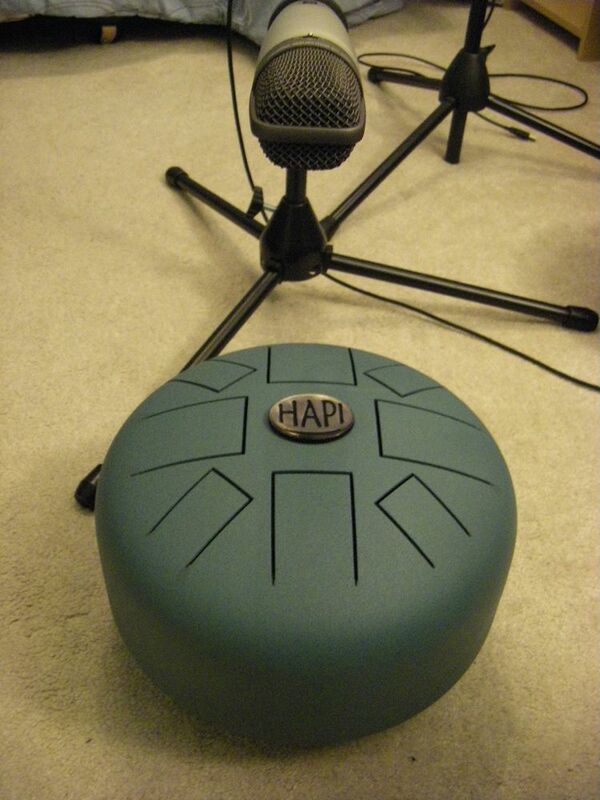 HAPI stands for Hand Activated Percussion Instrument, which doesn’t describe what it specifically is at all. Most percussion instruments are hand-activated, and these even also include mallets to “activate” the sound with as well. But that being said, they’re incredible instruments and I appreciate everyone who’s checked them out! For more info on Hapi Drums, check out the blog that I wrote to introduce them at Steve Weiss Music, where they can now be purchased too! This entry was posted in Blog and tagged drums, Ethnic Instruments, hang drum, hapi drum, jeff willet, Percussion, the gathering mist.